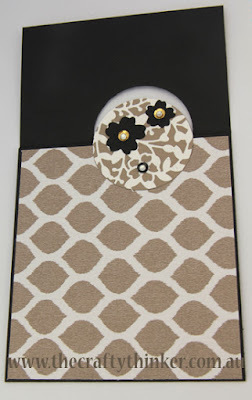 I enjoyed making the card for yesterday's Blog Hop so much that I made another one - this time using neutral colours. True to the name of the paper, I really went "wild" with this card! I used Basic Black to make the card. The lower front section is decorated with a piece of paper from the Go Wild Designer Series Paper Stack. The black and white paper at the top is from Everyday Chic and I added a little strip of Tip Top Taupe paper from the In Colour Designer Series Paper Stack. The flowers are cut from Tip Top Taupe, Basic Black and Whisper White cardstock with dies from the Bloomin' Heart Thinlit Dies. I've given them centres of sequins from the Metallics Sequin Assortment and Rhinestone Jewels. The sentiment is from Cottage Greetings stamped on a Whisper White label cut with a die from the Project Life Cards & Labels Framelits which I edged with Tip Top Taupe ink. I decorated the Tip Top Taupe 2" circle with a section of Whisper White Bloomin' Heart diecut. For the decorative butterfly, I adhered a Whisper White Bloomin' Heart diecut to the Tip Top Taupe card before cutting with the Bold Butterfly Framelit. Thank you once again to Patty Bennett for the great tutorial on this fun fold.